The Surefire Ryder™ 22 MINI offers the same great features as the larger models, but in a compact, sleek package, with only a minimal increase in sound attenuation. Built to the highest level of quality and craftsmanship that surefire is known for, the Ryder 22 Mini features heat-treated stainless steel baffles that offer increased durability and is capable of handling pressures of 17 HMR and .22 WMR ammunition. The sleek aluminum body is easily disassembled with individually numbered baffles for quick and easy cleaning. The Ryder 22 Mini stainless steel back plate contributes to overall durability. 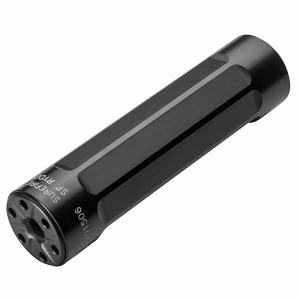 Single-point cut ½ X 28 threads provide secure and easy attachment to an appropriately threaded .22 caliber barrel, with no tools required. Assembly/disassembly tool for easy baffle removal included.